Here's a brilliant video on what motivates us. I guarantee you won't look away from the screen while it's on. Then you'll have some food for thought when it's done. 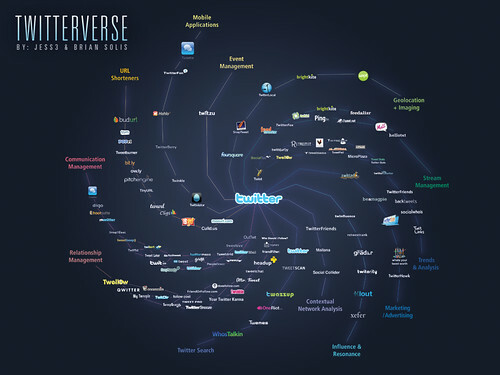 For those who like to see complex relationships in a visual, graphic form, check out this map of the Twitterverse as of May 2009. The other day my husband and I, both geeks according to our kids, got into a discussion on the differences between the development processes that were in vogue when we were first both active in IT and how the process and its placement within a company or process ownership has changed since then. It's a discussion we've had a number of times before in various forms. He's no longer in IT but that doesn't mean that he doesn't develop software tools for himself and others to use. And they're tools that follow this development process. Start with a small idea. Throw it up. Use it for a little bit. Decide what else it needs to be more effective. Add that in. Lather. Rinse. Repeat. This diagram was the start of our discussion. As soon as I saw it, I knew he would appreciate what it communicated. The diagram comes courtesy of Ben Malbon of Made By Many and the Powerpoint slides from his talk at the IPA Game Changers conference posted at Slideshare which is an interesting resource all on its own but that's another post. It's a development process that works well with web design and development. And its philosophy is supported by the Agile Manifesto. The left side elements are definitely my preferred mode of working, particularly the emphasis on 'individuals and interaction' and 'customer collaboration'. And 'working software' is always better than lots of pretty books and presentations that promise life will be better when you install xyz but don't actually deliver. Though I must add, as a former maintainer of systems and websites whose creator had long departed the scene, that some documentation is always of value. Some time ago I did some reading and research in preparation for some work with clients in the advocacy and political arenas. What I found confirmed my experiences in the volunteer world and in the 2004, 2006 and 2008 election cycles. It underscored the importance of connecting with people who frequent and participate in political websites, most of whom are influentials. Who are influentials? Influentials are the Americans who "tell their neighbors what to buy, which politicians to support, and where to vacation," according to Ed Keller and Jon Berry, authors of the book, The Influentials. Reader for reader, users of political websites are more influential than readers of even the New York Times online site (www.nytimes.com). The survey research firm Roper ASW reported that 50% of the New York Times website users are influentials. But according to a subsequent study by George Washington University's Institute of Politics, Democracy & the Internet (GW IPDI), almost 70% of people interested in political web sites are "influentials." These influentials are the opinion leaders and "change agents" of society -- the people who are actively engaged in creating change in their communities, workplaces, and the marketplace. Educated, and in positions of power and leadership in their work and their communities, they are the leaders who are looked to by friends and colleagues. The George Washington IPDI study notes that these percentages mean that online political people "are nearly seven times more likely than average citizens to serve as opinion leaders among their friends, relatives and colleagues, and are disproportionately likely to exert a 'multiplier effect' outward to the public at large." Foremost is their activism, which manifests itself through involvement in community civic and political activities. This common denominator cuts across the lives of all Influentials. Influentials are connected. They are the joiners and networkers. They have ties, usually strong ties, to more groups and organizations than the average American. When Influentials make a recommendation, they usually broadcast it to a large network of friends, relatives and acquaintances. Influentials have influence. "Because they know many people and soak up a large amount of information, Influentials stand out as smart, informed sources of advice and insight. They know a lot about some things and something about a lot of things, and if they don't know the answer, they probably know someone who does." Others look up to them for advice and opinions. Half of Influentials have graduated from college, and one in five has done postgraduate work. As the authors put it, "The Influentials' high level of education is probably a significant factor in their influence, giving them the ability to analyze problems and express positions in ways that are persuasive to others." Influentials' active minds seek out information--"In some ways, they are like human parallel processors, taking in information, rating it, sorting it, sifting out the element that's useful or interesting, and storing it away for future purpose." They are also opinionated. They don't hold back when they find something they like or don't like. Influentials are trendsetters, often tending to be two to five years ahead of the rest of society. Over the years, RoperASW has found that Influentials have been "predictive of changing political winds, and were, for example, early critics of Richard Nixon." These are the people that you want to attract to your online presence when they go seeking information. Not only are they more likely to act on what they find, they'll encourage others to do so. Whether your goal is to advertise your services, sell your products, advocate for your cause or enlist people in a campaign, you want to design your online web presence to appeal to and capture the attention of these influentials.